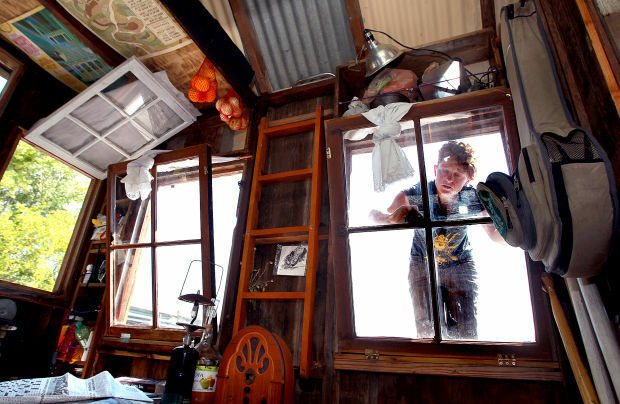 Kai Dalgleish washes the windows of Shantyboat, a home-made craft she on which and fellow artist Wes Modes are traveling the Mississippi River. They built the boat from salvaged materials. The craft moored to a city dock on the Black River in La Crosse looks so rickety that you would suspect it could be swimming with the fishes any second. But the man who built it from an old chicken coop is confident about its river-worthiness. It actually is a quite stable craft, which California artist and author Wes Modes has lovingly christened Shantyboat, reminiscent of the boats of yore, as he plies the Mississippi to unlock people’s secrets of life on Old Man River. Modes, of Santa Cruz, Calif., and two other artists from the same city — Kai Dalgleish and Jeremiah Daniels — began their expedition July 22 in Minneapolis and plan to end it in Davenport, Iowa, whenever they get there. Although Daniels left the crew a few days ago, Modes’ 3-year-old Australian cattle dog, Hazel, continues as a passenger. Along the way, Modes, a digital artist and sculptor who has worked in IT, is shooting video interviews of people they meet to be included in his “Secret History of American River People” project. Folks such as Anna Mae Davis of Latsch Island near Winona, who told Modes, “I think Latsch Island is where I found myself.” So much so that she has a tattoo depicting the island on her forearm. “History is not just wars and treaties,” said Modes, whose project is part of his thesis for his master’s in fine arts at the University of California, Santa Cruz. The project aims to preserve that history, with Shantyboat perhaps becoming an archival library at a museum, said Modes, who also has traveled the Missouri River and other waterways on makeshift rafts. “I enjoy the big rivers. The project brings together my interest in history, my interest in art, my interest in adventure and boating, and my interest in connecting with people,” he said. California-based artists Wes Modes and Kai Dalgleish are traveling down the Mississippi River from Minneapolis to Davenport, Iowa, collecting oral histories and stories of river people. Modes, a grad student at University of California Santa Cruz, is doing the project for his master’s thesis. The Shantyboat, built largely from salvage from a chicken coop, is powered with a 1968, 9.5-horspower motor. It also will include the health of the river itself, courtesy in part of interviews with John Sullivan of La Crosse, a retired water quality specialist who worked for the Wisconsin Department of Natural Resources for 28 years. “We’ve seen some things improve, such as the organic load and discharge from the Twin Cities,” which has improved the fisheries, Sullivan said in a phone interview Wednesday during a break from helping clear the canoe route on the La Crosse River. “The mayflies returned to the area with a vengeance, as we saw a couple of weeks ago,” he said. “Another good sign is the return of the bald eagles” because of improved water quality and habitat with the reduction of PCBs, mercury and DDT. Increasing levels of chloride — probably from road salt — pharmaceuticals and pesticides remain concerns, he said. “But generally in the La Crosse area, it’s not too bad in comparison to other cities,” he said. Sullivan also served as a cellphone courier for Modes, who wrecked his when he fell chest deep into a drop-off while launching Shantytown. Modes had a new one shipped to Sullivan, to relay to him at Veterans Freedom Park. Attesting to the value of the “Secret History” venture is Pat Nunnally, coordinator of the University of Minnesota River Life Program who also writes a blog titled River Talk. “Wes has certainly read more than a lot of people about the nooks and crannies of river lore,” Nunnally said in a phone interview. 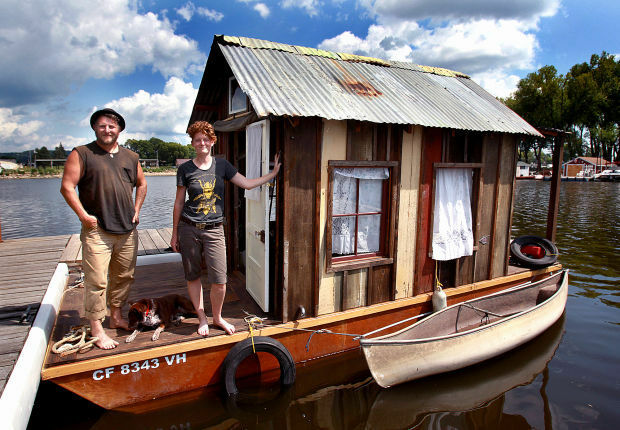 Modes said he and his colleagues built Shantyboat specifically to reflect the historical mission. “It’s a descendant of the flat-bottomed boats people took cargo on,” he said. “It is a hand-made wooden-hulled, barge-bottom boat,” a shape that remains stable, unlike the rocking motion of pontoons. Powering the craft is a 1968, 9.5-horsepower Johnson motor with the moniker of “Mr. Johnson.” The boat includes a tiny galley where they prepare tasty meals from a well-stocked cupboard, he said. The journey is funded in part with $5,417 raised from 81 backers who responded to a Kickstarter campaign, which Modes said will cover about a third of the costs, with the rest coming from the adventurers’ own coffers. Shantyboats date to the 1800s, he said, adding, “There were a spate of shantyboats in difficult economic times” in the 1890s and during depressions. “Part of my project is people living on the margins and see the river as a refuge from difficult economic times.